Prior to the 13th General Election (GE13) we came up with a methodology of predicting election results based on voting patterns in previous elections. Our method relied on mapping polling lane results to individual voters. This process assigned probability values (chance of turnout; chance of voting for each coalition) to the voter that was not affected if they migrated to another constituency. This is important because between GE12 and GE13 527,849 voters migrated to different constituencies. The impact of voter migration cannot be measured for a single seat by comparing the results of GE12 and GE13 for that seat. An analysis of the whole country needs to be performed. New voter registrations, voters passing away and voters no longer eligible to vote are other factors that require deep analysis. For this report we will focus on how Pakatan Rakyat (PR) and Barisan Nasional (BN) performed with regular voters (pengundi biasa) in P67.Kuala Kangsar and P93.Sungai Besar. This will give a sense of what to expect during the by-elections to be held on June 18th 2016. In addition to this we will also briefly examine political interest from Twitter users based in these constituencies. This may identify patterns that can be linked to urban youth in these areas. Postal and early voters are not part of this analysis. They need to be analysed separately due to their different voting process and difficulties in campaigning to both groups. Please remember that unless otherwise stated, all statistics in this analysis refer to regular voters only. We do not have access to the electoral roll being used for these by-elections and will be relying on estimated figures from the electoral roll for 2015 Q4 (4th quarter). 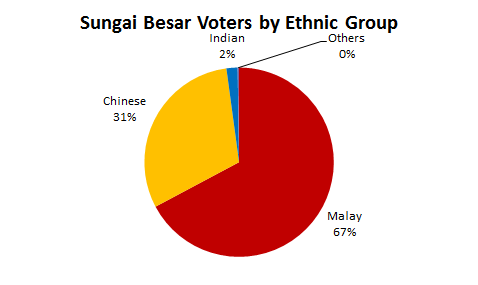 Demographics for Sungai Besar and Kuala Kangsar are listed below. The following charts show the estimated ethnic divide among voters in both seats based on our estimated electoral roll for 2015 Q4. This covers all voters (postal, early and regular). Both seats have had an increase in the percentage of Malay voters, and a decrease in the percentage of Chinese voters. The impact of voter migration cannot be measured for a single seat just by comparing results of GE12 and GE13 for that seat. An analysis of the whole country needs to be performed. New voter registrations, voters passing away and voters no longer eligible to vote are other factors that require deep analysis. For this report we will focus on how Pakatan Rakyat (PR) and Barisan Nasional (BN) performed with regular voters (pengundi biasa) in Sarawak. 31 of the total 222 Parliament seats are in Sarawak. Our analysis will focus on Malay, Chinese and Bumiputera Sarawak voters. Other ethnic groups such as Indians, Orang Asli and Bumiputera Sabah voters will be counted under the ‘Others’ category unless otherwise specified. This is due to their low numbers within the electorate and the lack of detail within the National Census data. Postal and early voters are not part of this analysis, other than the section on polling lanes. Postal voters need to be analysed separately due to their different voting process and difficulties in campaigning to both groups. The predicted support for PR based on GE12 was estimated to be low. This is because in GE12 the PR component parties did not contest all seats. SNAP and Independents contested BN in some seats with no PR candidates. There were also seats that were won by BN uncontested. PR was effectively untested in Sarawak. We tested analysis using SNAP and Independent results as ‘pro-Opposition’ in place of PR. However this approach made little impact on the analysis. A vote for SNAP or Independents also cannot be assumed as a vote for PR. To keep analysis consistent with a ‘BN versus PR’ perspective we did not treat SNAP and Independent candidate results as PR results. We will also present analysis of seats at the state (DUN) level based on individual voting at the Parliament level. It is not as accurate as performing analysis based on state-level results but it should be applicable for constituencies where voters voted for the same coalition (BN / PR) for both state and Parliament. Please remember that unless otherwise stated, all statistics in this analysis refer to regular voters in Sarawak only. Prior to the 13th General Election (GE13) we came up with a methodology of predicting election results based on voting patterns in previous elections (reference). For this report we will focus on how Pakatan Rakyat (PR) and Barisan Nasional (BN) performed with regular Malay voters (pengundi biasa) in Peninsular Malaysia. 184 of the total 222 Parliament seats are in Peninsular Malaysia, where most of the Malay electorate is concentrated. Elections are won based on the number of seats. 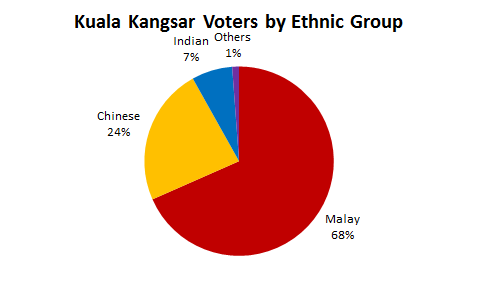 However our analysis will mainly be on the Malay electorate treated as a set of voters ignoring constituency boundaries. We will examine this at the state-level and for Peninsular Malaysia. This will allow us to see patterns that are not obvious at the seat-level. Please remember that unless otherwise stated, all statistics in this analysis refer to regular voters in Peninsular Malaysia only.